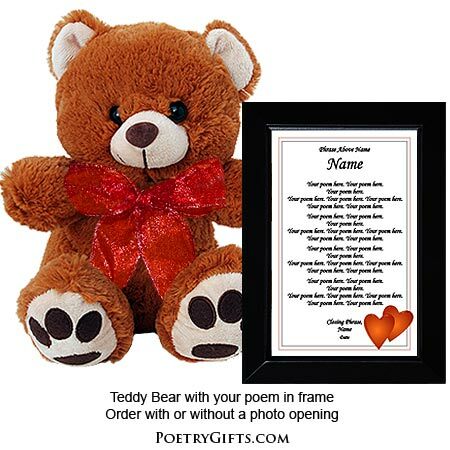 Picture YOUR poem in this modern black frame with a double red heart design (outer frame dimensions 5" x 7") accompanied by this adorable and huggable 9" teddy bear. The picture frame can be hung on a wall or displayed on a table or desk. There is also room for a favorite photo of your wife, husband, boyfriend, or girlfriend. We've given you the tool and now all you have to do is sit back and let your creative juices start flowing. Send us your poem and we will create a personalized gift you will be proud to give. 3. Closing Phrase and Your Name (as seen after poem) - (Examples: Love Always, Candice; With Love Always, Jeff; etc.)" Please look at the above design in order to determine a suitable poem length. We suggest your poem is 16 lines with about 12 words maximum a line. There are no set rules; this is just a suggestion. If your poem is much longer than the length we are suggesting, the font/type will need to be made smaller to accommodate your entire poem. On the order form, please make sure to type your email address that you check often and phone number in case the designer needs to reach you with any questions. Unless you have permission from the author or poet, please only submit non-copyrighted works.